What is that Big Silk Web in My Tree? By Chris Williams on April 20, 2014. Closer view of the eastern tent caterpillars. Eastern tent caterpillars’ silken web in the fork of a tree. Please don’t set your trees on fire. You don’t have gypsy moths. What you are seeing are eastern tent caterpillars. They seem to appear quite suddenly in the spring after their egg case hatches. The caterpillars spin communal silken nests in the crotches or forks of small trees where they live together in a large group of 50-200 individuals. You often see large numbers of these nests in wild cherry trees growing along highways. The tent caterpillars leave their nests, also in a group, three times a day to feed on the leaves of their host tree, later returning to their protective tent nest. The caterpillars enlarge their tent nest as they grow in size. When fully grown, the fuzzy caterpillars are about two inches long and dark with a white stripe down their back, and brown, yellow, and blue markings on their sides. Eastern tent caterpillars usually attack small fruit trees like cherry, peach, plum, apple, and crabapple. They sometimes feed on other trees like ash, birch, willow, oak, and poplar. Although they can defoliate portions of the tree, they are eating new leaf growth and usually don’t cause serious damage. The tree usually recovers and leafs out again. During bad outbreak years, the larvae may eat all of the leaves on their tree and will then migrate in a large convoy, looking for another tree. Fully grown caterpillars also wander singly when they are looking for a place to pupate. Fortunately, there is only one generation a year so the caterpillars are only around for a few weeks before they spin a cocoon and turn into adult moths. The adult form of the eastern tent caterpillar is a rather drab reddish brown moth, about one inch long, that doesn’t feed and lives only a few days. Yes, I’ve heard of people setting the nests on fire to burn the caterpillars inside. That’s risky business and certainly hard on the tree since the nest is built directly against the trunk. You could do much more damage to your trees than the caterpillars would. You can’t prune these nests out of your trees since they are built into the main crotch of the tree. Pesticides work only if you can spray the foliage or the caterpillars when they are out of the tent, since their web prevents the pesticide from easily reaching them when they’re inside. If you can reach the nest, you can use a dead branch or long-handled tool to pull the nest onto the ground where you can crush the caterpillars or drop the whole thing into a bucket of soapy water. There is a similar tree caterpillar pest that also makes a silken nest, called the fall webworm. People think they are seeing tent caterpillars again in the fall when they find similar silken nests. 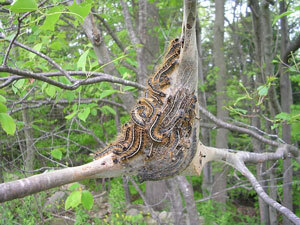 Fall webworms, though, make their nests at the tips of branches and can be easily pruned out of trees. They do little damage since they feed late in the season, just before leaf drop.